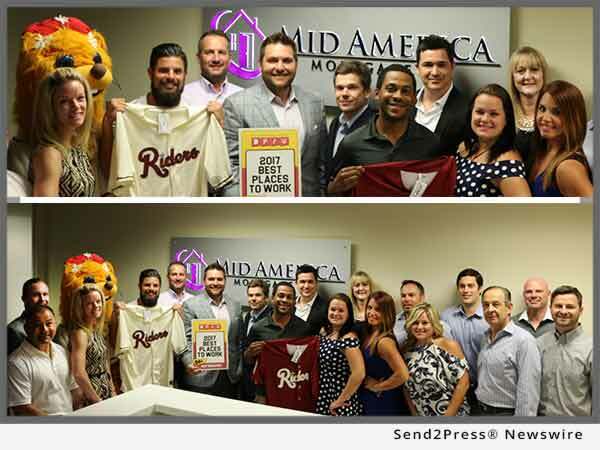 DALLAS, Texas, Jul 10, 2017 (SEND2PRESS NEWSWIRE) -- The Cooksey Team, a top producing retail branch of Mid America Mortgage, Inc., announced today it has been recognized by Dallas Business Journal as one of its "2017 Best Places to Work" in the Dallas-Fort Worth area. More than 500 companies submitted nominations, and only 100 companies were honored. Now in its 15th year, the "Best Places to Work" award showcases outstanding employers of all sizes in the North Texas region, and winners are selected based on a survey of employees conducted by Quantum Workplace, a third-party research firm specializing in employee engagement and experience. "My philosophy has always been, 'If my staff doesn't succeed, then I have failed,' and that's the approach I've taken from day one," said Michael Cooksey, founder of The Cooksey Team. "Having incorporated The CORE Training methodology into our overall professional development program, I've seen my staff achieve amazing results while also delivering an exceptional customer experience to borrowers, and to have those efforts recognized by not only the Dallas Business Journal, but also my staff is truly an honor." To view the full list of "2017 Best Places to Work," visit http://www.bizjournals.com/dallas/news/2017/06/26/2017-best-places-to-work.html.